Threshold switches KM 211· six measuring ranges, from 10mV...200V· high accurate· wide-range power supplies 19Vdc...255VacThe threshold switch KM211 can capture DC voltages of10mV...200V. In order to be able to exactly set the desiredlimit value, the total range is divided into 6 measuringranges as specified in the technical data.Fine adjustment in one measuring range is made bymeans of a trimmer in the front panel. The direction of thesignal to be monitored can be separately preselected ontwo dip switches (+/-). When both switches are closed(state upon delivery) the comparator operates symmetrically.The switching hysteresis can be adjusted from2...40% by means of another helical trimmer withoutchanging the switch threshold during such adjustment.A LED indicates that the preset limit value has beenreached. For control purposes, a potential free changeovercontact and a optocoupler output is at disposal. 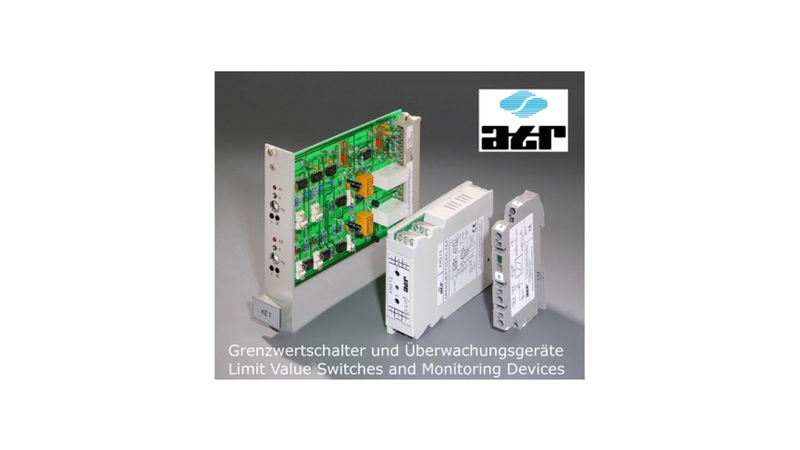 Devices with a much shorter switching time or forinverting switching are available upon request.The device have a galvanic separation wide-range powersupply, that allows a connection at all usual ac and dcsupply voltages (19Vdc...255Vac). They can be snap-onmounted onto support rails TS35.